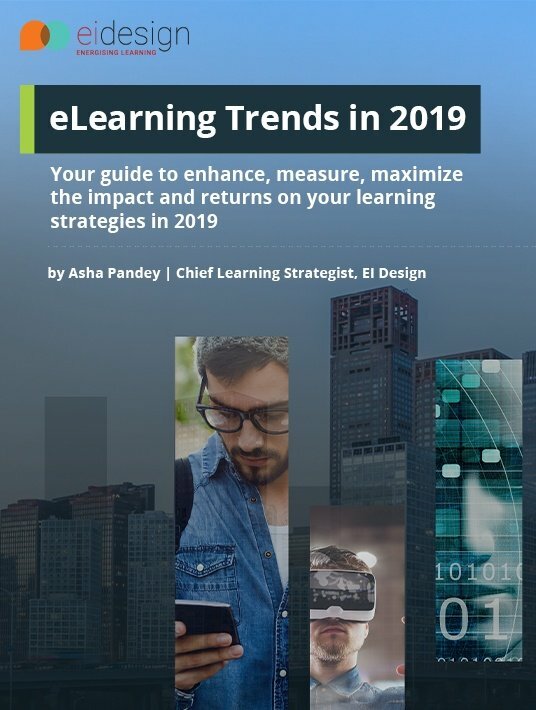 This free eBook, eLearning Trends in 2019—the fourth one in this series, has been designed to be your guide to enhance, measure, maximize the impact and returns on your learning strategies in 2019. Section 1 - The trends that help learners learn and apply this learning to show better performance or behavioral change. Section 2 - Learning strategies with a proven track record of delivering a better engagement quotient and higher training impact. Section 3 - The trends that organizations must invest on to measure, enhance, and maximize the impact of their training. Section 4 - Other notable trends to watch out for—the future is here! Every eLearning professional has a great interest in what is trending in the industry. Having a whole year ahead of you is exciting as it is, and the innovative concepts you'll find in this eBook add to this excitement. What's more important, is that EI Design aims at giving you insight on tangible benefits that you can tap into by opting for one or more of these approaches. See which trends promote learning, which strategies deliver better engagement, and which trends give organizations the ability to measure, enhance, and maximize the impact of their training. There are even more trends here, if you want to stretch your perspective further into the future and be ready for what the evolution of eLearning will bring.